Another Timewalking World Event concluded this week. I like Timewalking — I think it’s a great addition to the game. It allows people to see content they might not have seen live, and it’s a great way to level and get decent gear for alts. I’ve encountered people who don’t understand what this Timewalking concept is so I’ll go over it first. Timewalking was added during Warlords of Draenor. It is a week-long World Event where players go back in time to a specific expansion to run dungeons, which are scaled to feel close to what they were like when they were current content. I say “close to” because you don’t have the abilities players did back then. When a character does a Timewalking dungeon, their spells stay what they are now and don’t revert to what was available during that expansion. In order to queue for the dungeons — you can do that from your dungeon journal — you need to be 1 level higher than the maximum level for that expansion. For example, in order to queue for Burning Crusade Timewalking, you need to be level 71. Gear drops in Timewalking dungeons are currently ilevel 335 to 345. When you complete the quest to do five dungeons, you get 750 Azerite and a Cache of Uldir Treasures. The ilevel for the cache pieces is currently 355 and gear can be Titanforged or Warforged. You also get Timewalking badges and those can be used to buy toys, pets, mounts, heirloom gear, and rep tokens. 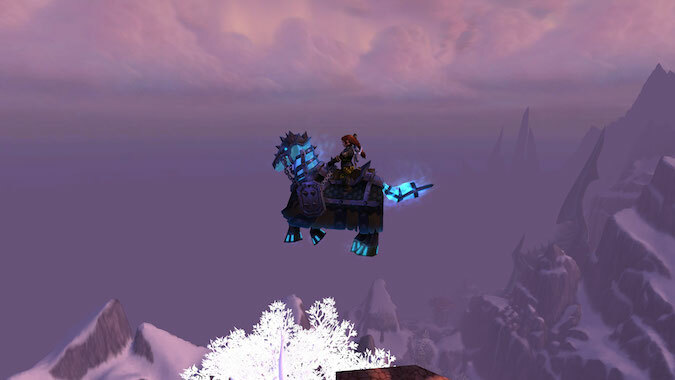 For instance, in Wrath of the Lich King Timewalking, you can get a Bridle of the Ironbound Wraithcharger. 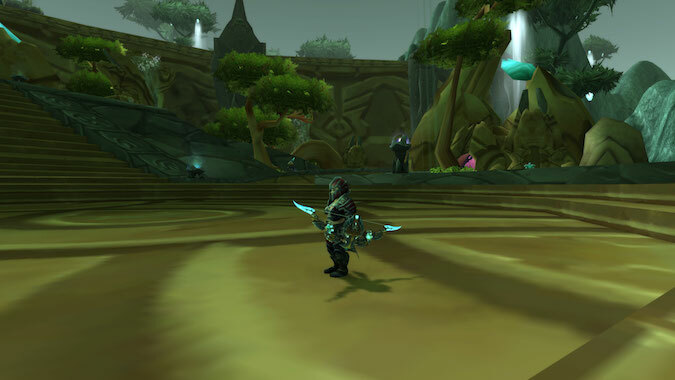 If you collect mounts, toys, and battle pets, or if you’re working on reputations, Timewalking is a reasonably easy way to obtain these items. Those are the good things about Timewalking and with Warlords of Draenor content coming in Patch 8.1.5, there will be more opportunities for more stuff — but all is not badges and seeing old content. The first day we could run Black Temple as a Timewalking raid, my guild and I were banging on the door. “Illidan! We ARE prepared!” — or so we thought. We couldn’t see the quest giver. Frankly, I was a bit concerned about the ability to clear the raid in the time we allotted, but if the dungeons aren’t that hard, how bad can it be? The same thoughts crossed my mind when Ulduar opened. As it turns out — it could be bad. First of all, both Black Temple and Ulduar are filled to the brim with trash. I adore Ulduar, but you spend so much time clearing trash — double that for Black Temple — that actual time spent killing bosses is minimal. I feel we would have been better served to have Serpentshrine Caverns and Trial of the Crusader be the representatives of these expansions. Although SSC has trash, it’s not quite as packed. In Ulduar, we quickly hit an example of the second — and most problematic — issue with Timewalking raids. The raids are not scaled properly. There can be a wide difference between the attacks of one versus the attacks of another. I’m not talking about not knowing the fights and being unprepared for boss attacks. I’m talking about the mathematical difference between the size of health pools and the amount of dps needed to down a boss. Some fights you can chalk up a wipe to “people didn’t do this at level so they don’t know”. Some — like Bloodboil in Black Temple — hit way too hard. Even with mitigation and all the healers working hard, he killed both tanks within a minute of engaging. He’s not supposed to do that. We blasted through bosses in Ulduar. Razorscale felt off in the opposite direction — we should have had more of a problem than we did, but we shrugged and went deeper into the raid. Ignis gave us an issue and we nearly wiped on XT. The Iron Council was a breeze. Then we hit Kologarn. We struggled to get his arms down. According to the strategy, you needed to do 100,000 damage to break anyone out of his Stone Grip. We’re not technically undergeared, but our best players struggled to hit 1.5k DPS. The average for the raid was 1k. We could not hit 100,000 damage in time without Time Warp — for just one lousy arm. The problem is, how does one increase one’s damage production when this is a Timewalking event? At level, you ran content to get better gear. When you run into Timewalking, an algorithm scales down your current gear to a level comparable to what it was when the content was current. Without a reputable source of information regarding what is and is not good for raiding these dungeons, what you need is anyone’s guess. For Ulduar, wear some of your Legion legendary armor. Any legendary weapon from Wrath of the Lich King through Cataclysm is useful. Bring those Mists of Pandaria capes. Grab your Icecrown Citadel reputation ring. Has the gear got sockets? Hallelujah! Gem those things. It’s pretty much “bring it along and see”. Don’t say, “Get yourself some mythic Uldir gear.” Gear scales, remember? Your mythic gear is no better — and perhaps worse — in the raids than a hodgepodge set is. The dungeons are a whole different animal and you simply can’t apply dungeon running gear to the raids. Above is my Beast Lord set and Thori’dal. This works perfectly when doing Burning Crusade Timewalking dungeons. It’s less effective in Black Temple Timewalking. 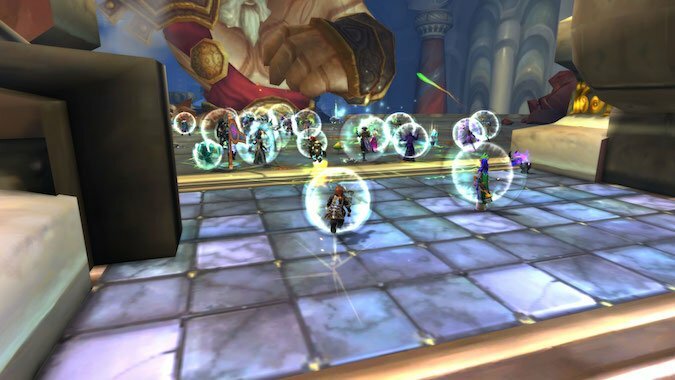 We had two priests with Val’anyr — that’s what produced the bubbles in the header photo. Our issue wasn’t healing. It was DPS. We ran Timewalking dungeons after quitting the raid and had no issues. I’d like to see a Cataclysm raid added to Timewalking, but given the issues we had in Black Temple and Ulduar this shouldn’t be done until the problems of scaling are addressed. As we get deeper into Battle for Azeroth and obtain gear with more abilities, these scaling issues become more pronounced. 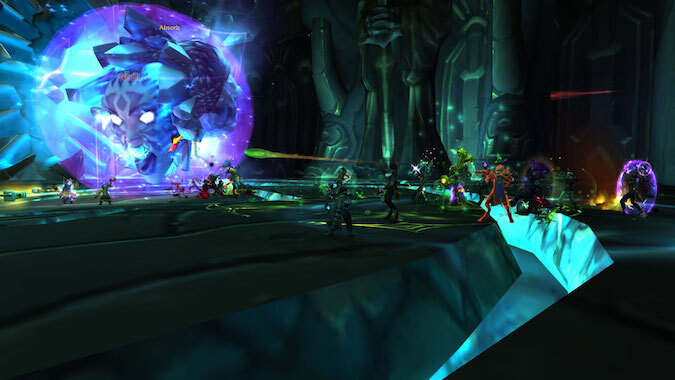 If the Timewalking premise is “simple” scaling, the raids don’t do it. I’m frustrated. If I’m frustrated doing this with a raiding guild, how much more frustrated are pick up groups? It’s not about not knowing the fights. The scaling in gear and bosses is off — maybe even bugged.